When there is time and a budget, I am always on a hunt for new places to explore. In my previous article about the different places I want to visit in the Philippines, I included Marinduque. Good thing I saw an event posted by GalaPh that they were planning to do a Marinduque adventure. I immediately signed up for the event and prepared myself for a great escape! Instead of planning the itinerary, GalaPH already organized van transportation from Manila to Dalahican Port in Lucena Quezon. Basically, the tour group organized everything for the entire trip to Marinduque and that was very convenient on our part. Nature lovers and adventurers find Marinduque appealing and a place full of fun and adventure. It boasts its rich agricultural lands, gigantic mountains, fertile jungles, picturesque islands, and beaches. Marinduque is a region situated in Luzon, part of MIMAROPA and is tagged as “The Heart of the Philippines”. During Holy Week, Marinduque celebrates its Moriones Festival. This place is definitely a destination you will find hard to ignore. From food, beaches, caves, unspoiled islands, adventure, and many more; Marinduque has what it takes to be the next favorite destination of tourists. Here are the different places we explored during our 3 days and 2 nights in the Heart of the Philippines: Marinduque! Ancestral houses are properly preserved in the town of Boac, creating a lasting impression to visitors of this town. Antiquities and old houses are dominant in Boac but sadly, some houses are in a state of dilapidation and will soon be demolished. If you are looking for a place to find a great view of the town, this is the place to be. I am not a Catholic myself but I do admire churches specially the history behind them. This church was built in 1782 and believed to have saved the people from the Moros in the 18th century. On the side of the church, you will find a museum and stairs leading to the rooftop where you can get a nice view of the town and a perfect way to start your adventure on the Island. The Island of Marinduque is home to a variety of butterflies and that’s what we came to see as well. Unfortunately, we arrived during the wrong season and found none. But who knows, they may have lots now waiting for you to visit them. I don’t mind visiting the place again on my next visit. While in Gasan, might as well visit another beautiful church which is the Saint Joseph Parish Church. This is actually one of the most beautiful churches I’ve seen as well. The intricate detail of the door was a complete work of an art. The banahaw leaf inspired ceiling created a very refreshing and peaceful ambiance. And as you go out, you can also get a nice view of the town. When I heard about the Malbog Sulfur spring, the first thing that came to my mind was the smell of the Sulfur. But it wasn’t that bad at all, anyone could get used to the smell easily. Sulfur is known for its healing properties that is why this place is also a very famous tourist spot in the Island. I thought, at first, it was hot but it wasn’t. At the side of the pool, you will find a small lagoon or pool where you actually see bubbles coming out from the ground. This was indeed interesting and a fun place to swim with a lot of benefits! A beautiful white sand beach, this was the place where we decided to stay on our first night. When we arrived it was very busy. This place seems to be very famous for both tourists and locals. They have rooms and cottages for rent here too. Luzon Datum is a stone marker situated on the top of a mountain. To get to the top, you will need to hike for an hour. Depends on how fast or slow you walk. Make sure that you have water with you as it could be exhausting. But once you reach the heart of the Philippines, you will be welcomed with a stunning view. This is a very important marker used as the first point for all the map makers in the country. And to be able to reach the heart of the Philippines was a great experience and a bragging right! A one hour travel from Gasan to Sta. 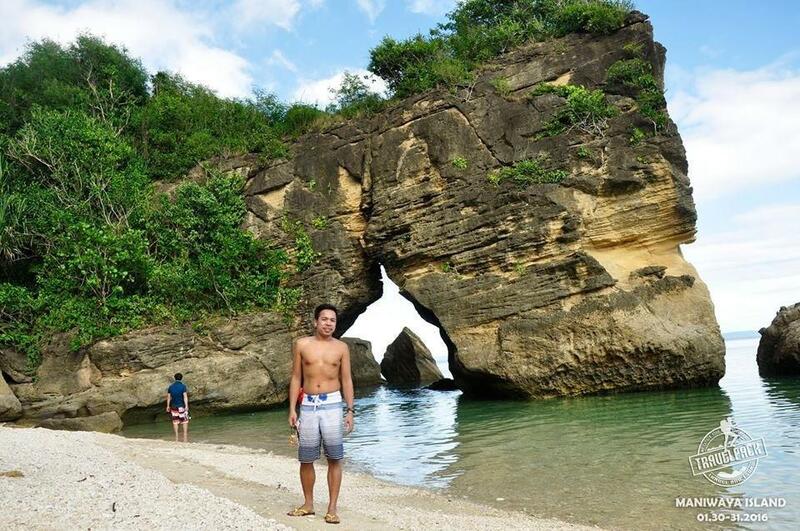 Cruz, will take you to the wonderful village of San Isidro where the Bagumbongan Cave is situated. A scenic Subterranean River was discovered by the tourism officers Marinduque last 2009. Before spelunking Bagumbungan Cave, you will have to listen to a short lecture conducted by your tour guides. You will be allowed to choose whether to go inside and see the waterfalls or just go back. Inside the cave, you will experience a waist deep waters. The local government made a huge effort in preserving everything that’s inside. The towering and magnificent stalactites and stalagmites are real beauties! There are also flow stones that look truly amazing. Some bats and other creatures also live here. Spelunking is a test of strength and endurance because it will take approximately 4 hours to finish the entire journey throughout the cave. You will have to go over slippery stones and do a lot of swinging with a rope. Wearing proper gear is a MUST. After the long trail, replenish your strength with fresh coconut juice and halo-halo. “An Island Of Your Own”, this small island is not overcrowded, unlike other beaches, giving utmost peace and harmony. Maniwaya Island is a famous destination in the province of Marinduque. The travel takes 2 hours by land and 30 minutes by boat. It’s the farthest among three islands, so expect a longer travel period. But everything will all be worth it once you reach the Island. Maniwaya Island is slowly catching the attention of vacationers especially the ones coming from Manila. This island is indeed a real beauty yet it offers very affordable packages. Situated farthest from the mainland of Marinduque, just about 1 hour from Buyabod port, Santa Cruz. White beach, crushed corals, picturesque sceneries engulf the majestic island of Mongpong. We are supposed to visit this island but due to weather, the boatman decided to go back instead for our own safety. And suddenly a friend of mine, Jef Manalo posted a photo of him at Mongpong on a clear sunny day. I was so jealous! Haha! So on my next visit, this is the first place I want to visit. This small island is ideal for swimming but be sure to plan your visit to this island because the sandbar only appears when it’s low tide. But either way, you are sure to get a great experience here! Do not forget your snorkels as this sand bar is also a great spot for snorkeling. I am very thankful that I found the post of GalaPH on Facebook. I don’t know If I would be able to explore the whole Island by myself. It was a great crowd and we all bonded so well in the end. There are so many memorable things happened during our adventure and one of them was sitting on top of the jeepney and greeting almost everybody we saw along the road. It was so much fun that from the day we started all the way up to the end of our adventure, we were all top loading! If you are traveling as a group and would like to tour around the island, you may contact our Jeepney driver RUDOLF at this number: 09084186130. And if you want to check on the future tours of GalaPh, you may check their Facebook page. The streets are looking like Vigan, right? Such hidden treasure. I'm barely scratching the surface exploring the Philippines. There are just soooo much to see! Exactly Lux! They are amazing! You are so correct. So much to see but so little time and budget. I’ve check out this post and if I could I actually desire to suggest you couple of interesting.